We call them candlestick charts. What the heck do candles have to do with trading stocks? Most of the candles and candlestick patterns on a chart look more like elevators going up and down. And it makes more sense to call them elevators. Why? Because elevators actually go up and down! At the left of the chart, this stock is going down but the "candle" is closing near the top of the range creating bottoming tails on the chart. These candles look like the elevator has gone to the top floor. This stock wants to go up. Then, in the middle of the chart, you have a stock that has been in a nice uptrend but now it is just trading sideways. The candles are closing near the bottom of the range creating topping tails on the chart. These candles look like the elevator has gone to the bottom floor. This stock wants to go down. If you are new to reading stock charts, you are going to hear some ridiculous names given to candlestick and various patterns associated with them. Think of them as elevators. 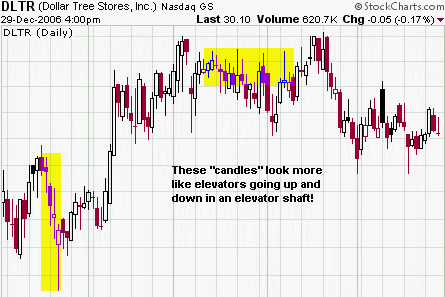 Instead of calling them candlestick charts, we should call them elevator charts! The Q's (QQQQ) could be setting up for a nice shorting opportunity. The 10 period moving average has just crossed down through the 30 period moving average. In the past, this has either led to a trading range or a change in trend. If it falls through 43, there isn't much in the way of support until at least 42 (and maybe lower). I love watching these videos. And since my Dad is a huge Harley Davidson fan, I was anxious to watch it. Have you ever been in a Harley Davidson store? I have and I can sum up the whole experience with one word: EXPENSIVE. I mean ridiculously expensive! Products such as t-shirts, hats, sunglasses, etc. are expensive - all because they have that famous Harley logo. But people pay the money for it. Why? Because they are unique and you can't get the products anywhere else! That makes this company special and attractive to investors. Here is a chart. Let's apply Trader Vics trendline trick - The 2B Rule. "In an uptrend, if a higher high is made but fails to carry through, and then prices drop below the previous high, then the trend is apt to reverse." So I wouldn't buy the stock now, even though I think Harley Davidson is a great company. It is easy to buy a great company at the wrong time. 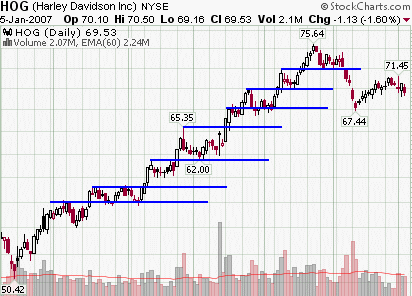 Also, Brian Shannon has a very nice charting video on Harley Davidson. Is it possible to predict future price movements? According to John Crane it is. In his book, Advanced Swing Trading , he talks about reaction swings, reversal dates, and cycles used to predict future price movement. By constructing action/reaction lines and by reverse counting price bars, it is possible to predict where the next high and low of the swing will take place. This book is not an easy read. It's complicated and you should really have a solid understanding of technical analysis before your read it. But I like it because it talks about market behavior better than most books I've read. You may blow off this concept of actually trying to predict in advance what a stock will do in the future. No problem. BUT - this book is an excellent introduction to market cycles and price movement. 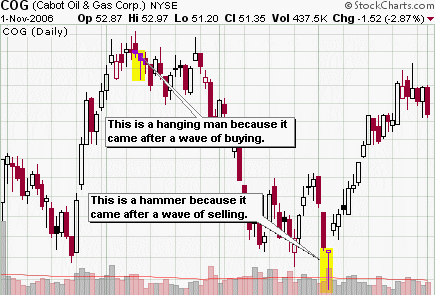 This candle is both a Hammer and a Hanging Man candlestick pattern. It depends on where it appears on a chart to determine which pattern it is - and if its bullish or bearish. Hammer: This appears after a wave of selling has occurred. This is considered bullish and you would look to be a buyer. Hanging Man: This appears after a wave of buying has occurred. This is considered bearish and you would look to be a seller. You can see in the chart that even though the candles are the similar, they have very different meanings. One is bearish and the other is bullish. If you visit many forums or blogs, you will see traders going long on what they think is a hammer - but in reality it is a hanging man! This pattern is both a shooting star and an inverted hammer! Again, it depends on where it forms in the trend to determine if its bullish or bearish. Shooting Star: This appears after a wave of buying has occurred and you would look to be a seller. 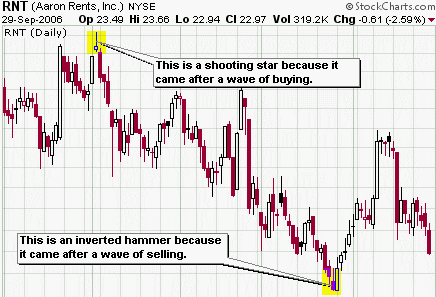 Inverted Hammer: This appears after a wave of selling has occurred and you would look to be a buyer. And you thought the Japanese language was confusing to learn - try reading their dang charts! If you've read any books on technical indicators, then it's likely you already know about divergences. This is when a technical indicator will show one thing and the price action shows another. This can be either bullish or bearish depending on the chart. But do you need a technical indicator to tell you when there is a divergence. Not really. 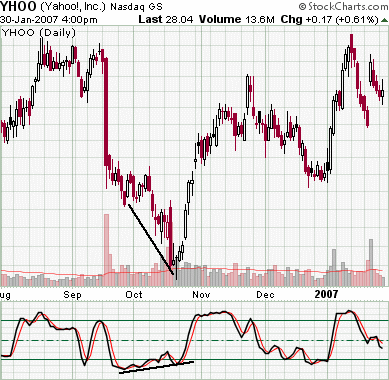 In October, Yahoo continued to make new lows but Stochastics did not. This was a clear divergence with price. But you can tell by looking at the chart itself that the bulls were beginning to get aggressive. There were more bottoming tails. It started closing near the upper part of the intraday range. It began having consecutive up days. So by looking at the price action itself, you can usually tell when the bulls are beginning to take over or when the bears are beginning to take over. You don't need a technical indicator to tell you that. It's all right there on the chart! This is a home study course that teaches you how to trade stocks from full-time swing trader Kevin Brown. Definitely one of the best swing trading eBooks that you can buy. Looking for the best stocks to trade? Here is a list of the best scanning and charting services available today. Are you looking for an easy trading system to follow that takes all the guesswork out of when to buy and sell stocks? Click a button and this software program will tell you what the stock price will be into the future. Give this service a test drive. I think you will really enjoy tinkering around with this trading algorithm! Download 14 free technical analysis and stock market related eBooks - at no charge! What Are the Best Stock Market Books? See my list of the top technical analysis books that I think every trader should own. This course teaches you all the common candlestick patterns, shows you the backtesting for each pattern, and then puts it all together into a complete trading system.